The County of Chenango is excited to announce the launch of a new program that we feel will have a significant impact on the promotion of our County. We have entered into a three year agreement with CGI Communications to produce a series of streaming online videos highlighting all our community has to offer its residents, visitors, and businesses. CGI is a leader in online marketing solutions, working with thousands of communities and businesses nationwide. With an easily viewable interface on the official County website www.co.chenango.ny.us , the video showcase will engage viewers in learning more about area attractions, economic development opportunities, quality of life, and so much more. 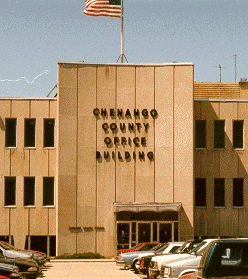 The County of Chenango is dedicated to highlighting the advantages of living and working in our community, and we feel that this program can do just that! In addition, CGI will be contacting members of our local business community to offer participation in the program, as well as an opportunity to learn more about CGI's innovative new digital media products for businesses. In addition to having exposure on the county's official web site, our videos will be featured on the Community Video Network (CVN), a national online network to assist people relocating nationwide. We encourage you to consider supporting the program, and learning more about all that CGI has to offer.